Drop it off a building, throw it down the stairs or carry it around in your bag with no padding. Lighting Science says that its new Durabulb can withstand all of that and more, making it the world's first (nearly) unbreakable LED light bulb. The lightweight bulb consumes about 80 percent less energy than incandescent bulbs and slashes the packaging materials needed to ship it thanks to its ultra-rugged design. The game-changing bulb was even lauded recently by actor and environmental activist Leonardo DiCaprio, who called it a "great new, innovative light bulb that uses about 80% less energy and has a takeback program to keep it out of landfills." The secret behind the Durabulb‘s shatter-proof design is its flexible, bouncy polycarbonate plastic shell. Rumsey explained that the LS team had quite a good time testing out the Durabulb by dropping it off of an eight-story building and bashing it with a tennis racket. “We even mailed it unpackaged through the U.S. postal system, with nothing but a label on it, and it still worked,” he said. Because it’s so hard to break, the Durabulb needs much less packaging than other similar products. Unlike other bulbs, it can be shipped in bulk in plastic tubs using about 30 percent less material than other bulbs. In addition to its durable, waste-reducing design, the Durabulb boasts omni-directional amber light and lasts up to 10,000 hours. Lighting Science also plans to offer a take-back program where consumers will be able to trade in the Durabulb for a 50-percent-off coupon after its three-year warranty ends. The Durabulb is set to launch for sale soon at Menard’s and Home Depot and on HSN. The secret behind the Durabulb's shatter-proof design is its flexible, bouncy polycarbonate plastic shell. Rumsey explained that the LS team had quite a good time testing out the Durabulb by dropping it off of an eight-story building and bashing it with a tennis racket. "We even mailed it unpackaged through the U.S. postal system, with nothing but a label on it, and it still worked,” he said. Because it's so hard to break, the Durabulb needs much less packaging than other similar products. Unlike other bulbs, it can be shipped in bulk in plastic tubs using about 30 percent less material than other bulbs. 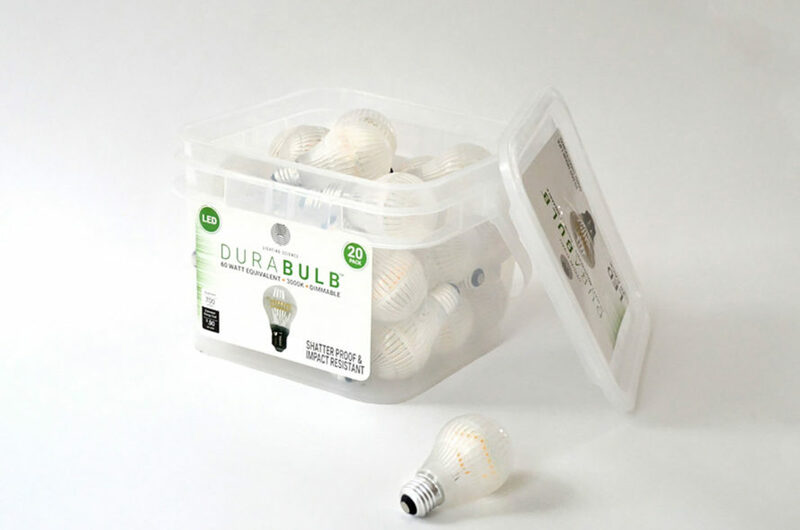 The Durabulb is set to launch for sale soon on HSN and at Menard's and Home Depot for approximately $30/bulk tub of 20 bulbs.